Ariane Garrett is a junior majoring in biomedical engineering and Spanish. She is involved with research under the mentorship of Dr. Kazunori Hoshino, and is part of the eighth cohort of UConn IDEA grant recipients, as well as being a SURF recipient and Holster Scholar. Her research focuses on the development of a "smart" cerebral spinal fluid shunt capable of measuring flow in vivo. Outside of classes, she is the Vice President of Engineers without Borders, and is passionate about making technology accessible to all. Ariane enjoys running, reading, and hanging out with her dog. Please feel free to reach out with any questions or concerns! 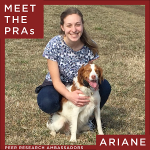 Learn more about Ariane in her Meet the PRAs interview!